It is important at the outset to think about WHO should be involved in the Play process of your exercise. Is it an expert group or can it also be your participants themselves? 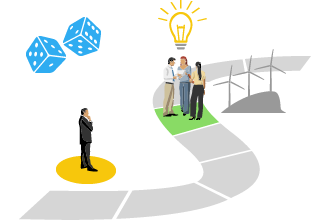 Our advice is tailored to a project manager who runs the exercise, whether it uses a top-down or bottom-up model. Following the general guidance below, we have identified three basic play formats within this guidance which provide a starting point for your own adaptation in line with your exercise goals. Read some of the case studies to learn about different approaches used in Play mode. This guidance has been based on our experiences with designing and playing games with our partners and other groups. Again, these need to be evaluated within your own resources and timetables. We recommended that sessions last no longer than 2.5-3 hours at any one time. We recommend 4-5 questions at most, with entrance and exit tasks used as appropriate. It may be helpful to plan who sits at which table to ensure that a range of different interests, agencies or viewpoints are present. 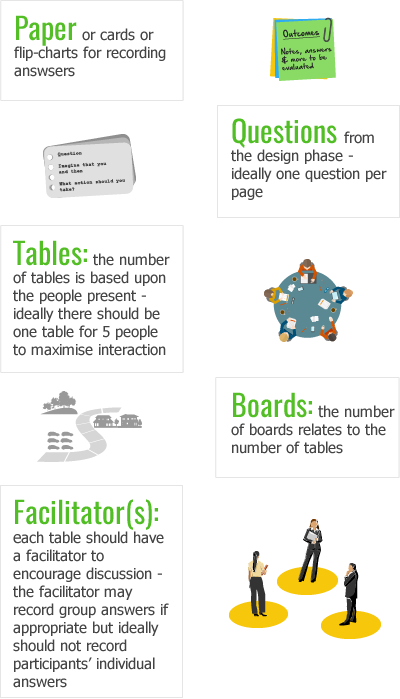 Each table should have 5-6 people (max) plus a separate facilitator. Dice should be used to move around the board; the throw of the die determines the question to be answered and discussed. Each table usually plays their own separate game to enable cross-table comparisons and discussions afterwards, although nothing stops everyone playing the same game if that is what is desired. One player reads out the question (from the separate question folder) which is then followed by a table discussion usually of around 10 minutes. one group answer or decision is logged, with justification. The entrance/exit impact may lead to further discussions according to the goals and time resources of your exercise. There should be a feedback session (‘debrief’) across the tables and a report capturing the key outcomes. This is where people play the game in its traditional format with group discussion proceeding to individual views and responses. The guidance above is followed. The key feature here is that the group discussion leads to each individual person writing their own answer in response to the discussion that has occurred. This is where you want each table to reach some agreed viewpoint rather than to make individual based decisions. This reflects the political reality within which much decision making usually takes place. However this is likely to be a longer process and you will need to reduce the number of questions or extend the session. 1. Design a simple evaluation questionnaire for participants to complete after the exercise. 2. 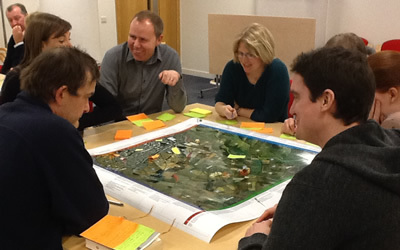 Design a simple questionnaire for the project team (including facilitators) to complete shortly after the event. 3. Consider holding a team meeting to capture reflections after the event to capture short-term impacts and reflections; if appropriate, repeat after some weeks or months to assess longer-term/decision-making impacts.